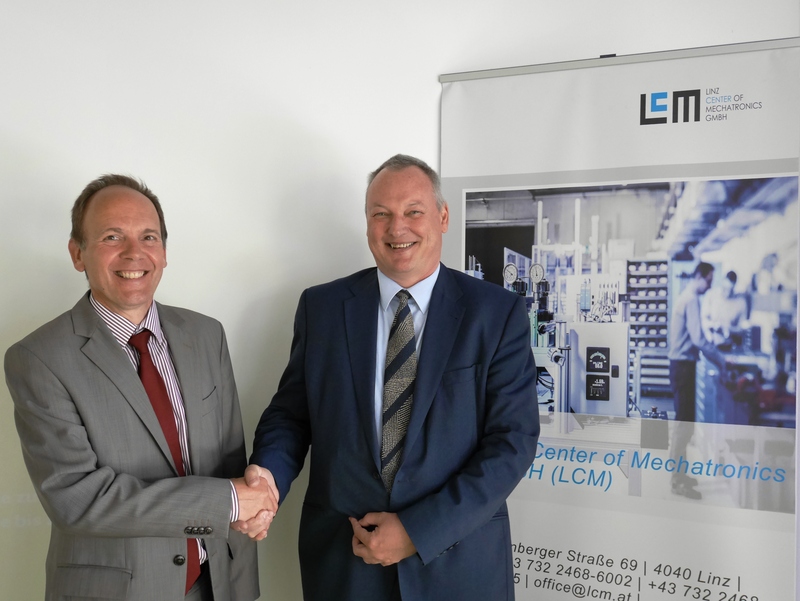 On 11.05.2016, Mr. Paul Vanoverloop from the Belgian embassy visited the Linz Center of Mechatronics GmbH. After a company presentation, Mr. Vanoverloop had an opportunity to see some practical examples of selected LCM areas of expertise in the form of non-confidential projects: in the area of simulation, the LCM software tool HOTINT was presented. This tool enables an efficient and cost-optimised simulation of processes, components and systems as well as their interaction. A module developed by LCM for active vibration damping and successfully launched on the market was demonstrated in practical applications. The highlight in the area of hydraulics is the digital valve developed by LCM. The successful market launch of this in-house development resulted in the emergence of a truly disruptive innovation. In the area of sensors, LCM subsequently presented some localisation and tracking projects. The Belgian Economic and Trade Council had great interest in strengthening cooperation beyond the existing collaboration with Belgian R&D organisations. This visit underlines the international orientation of LCM.